Once a proud and thriving nation established by freed African slaves, Liberia is now one of the continent's poorest countries. High poverty levels, post-war trauma and economic struggles make life in this West-African country extremely challenging. SOS Children's Villages helps the next generation of Liberians to get their country back on track. 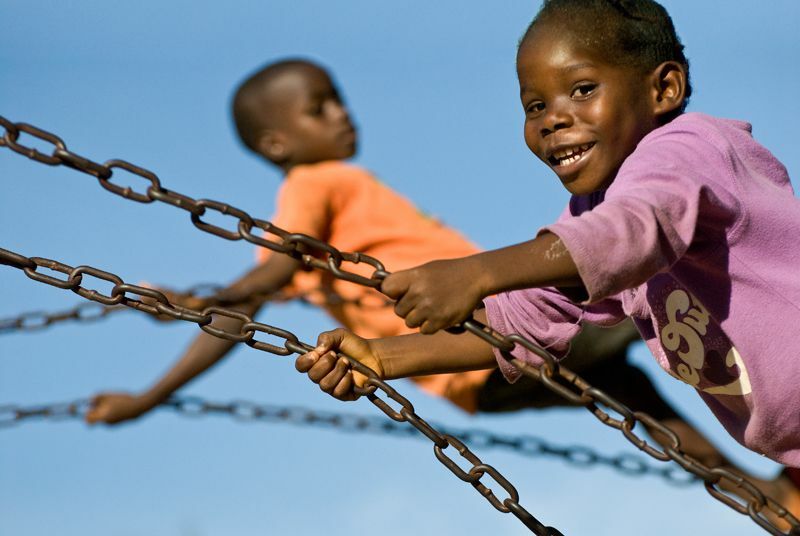 The activities of SOS Children's Villages in Liberia were initiated in 1978. The SOS Children's Villages always remained a safe haven for families and children in need during the many years of cruel civil war. As much of the country's school infrastructure was destroyed, the SOS School is particularly important in Monrovia. SOS relies on the kindness and generosity of Canadians to be able to provide a home for the most vulnerable children of Liberia. Please help us ensure a loving home for every Liberian child. Sponsor a child in Liberia now. The lack of resources is endangering the lives of children. In a country so deeply shattered by 14 years of civil war, child rights used to exist only in theory. During the war, the country's youngest people were worst affected: thousands were recruited as child soldiers, many were orphaned and others killed. While child rights violations have always occurred in Liberia, the civil conflict exacerbated the problem in all forms and in almost every region of the country. 340,000 Liberian children are now growing up without parental care. Efforts are being made to create a liveable environment for young Liberians. Supporting the country's children and young people has become a top-priority in the complex recovery process in post-conflict Liberia. In certain areas of Liberia, neither medical centres nor schools exist. Many of them were destroyed during the war and have never been rebuilt. The result is an alarming illiteracy rate of 40% among Liberians aged 15 or above. The current government has undeniably been making progress, offering free primary education to all Liberian children and investing in school infrastructure. Education is the key to a better future: a massive poverty reduction programme for Liberia (LBPWP) also includes the rehabilitation and reconstruction of schools in order to increase access of rural communities to education. Since 2007, enrolment rates have increased significantly. However, due to a lack of resources, many schools are struggling to take in more students. Because of their critical economic situation, many families cannot afford to adequately feed their children. Thousands of children are severely undernourished and one in every five Liberian children is underweight. Since it is a well-known fact that reducing poverty among young people contributes to stability and peace, there have been substantial efforts to increase job opportunities for the country's youngest segment of population. SOS Children's Villages is supporting Liberian young people and children by providing day care, education, and medical care in three different locations (Juah Town, Monrovia and Sinje). SOS Children’s Villages aim is to strengthen families in order to keep them from breaking down. Children whose parents cannot take care of them will find a loving home in one of the SOS families. Political instability has shaped in Liberia. The total population of Liberia is 3.9 million. In 1822, freed African slaves established present-day Liberia (“liberty”) and named the capital city Monrovia after James Monroe, the fifth president of the United States of America. Ties to the USA have always been strong, making Liberia one of only two African countries that were not affected by the “Race for Africa” in which European powers invaded and colonized vast parts of the continent. Until a military coup in 1980, Liberia enjoyed economic and political stability. However, during the 1980s and 1990s the country went through periods of authoritarian rule, oppression and a cruel, long-lasting civil war. Around 250,000 were killed and many more fled the fighting. Following international pressure, warlord and former president Charles Taylor stepped down in 2003 and went into exile. In 2012, he was convicted for war crimes and was sentenced to 50 years in jail. Since 2006, Ellen Johnson Sirleaf has been President, and in 2011 she was awarded the Nobel Peace Prize. Despite serious efforts by the current administration, the rebuilding of war-torn Liberia is an extremely difficult task. Around 15,000 UN peacekeepers are currently stationed in Liberia, but the security situation is still fragile. Before the global financial crisis, Liberia saw its GDP rise by roughly 14% every year. The African Development Bank has approved a debt relief package of USD 237 million, stating that the country has met all relevant requirements, including substantial progress in the areas of poverty reduction, macroeconomic stability and good governance. Rebuilding infrastructure is one of the top priorities. In recent years, the government has worked hard to improve road accessibility, school and medical facilities. The Liberian civil war essentially destroyed the country's infrastructure and further aggravated the crippling poverty among Liberia's population. Liberia is now one of the poorest countries in Africa. Many basic services such as running water, public power supply or sewage systems are unavailable, particularly in rural areas. Around 83% of the population face a life on less than 1.25 US dollars per day and living conditions are particularly harsh in Monrovia. In rural areas, 93% of the people have to use water from unimproved sources and thousands remain without any access to water. In some areas, people use rivers or swamps as latrines. The prevalence of undernourishment among Liberians is as high as 31%.